Friends of the Rappahannock (FOR) has multiple restoration programs that work to protect and restore the ecosystem services provided by the Rappahannock River. Our oyster reef restoration works with landowners, watermen, river bottom lease holders, partner groups, students, and local businesses to protect and restore native oyster reefs in the tidal Rappahannock River. The goals of this program are to promote a clean and healthy Rappahannock River, enhance habitat for fish and wildlife, restore oyster populations to sustainable levels, and ensure a resilient and bio-diverse broodstock is proliferating in our tidal ecosystems. How much water does an Oyster filter per day? One mature oyster can filter up to 50 gallons of water per day which helps to remove nutrients and sediments from the Rappahannock River and Chesapeake Bay. Restoring oyster populations to historic levels would have an incredible impact on water quality throughout the region. Where do Oysters like to Live? Oyster larvae or “spat” need a particular environment to survive and grow into mature oysters. They need certain water conditions to thrive including a saline water environment, but more important is the substrate available on the river bottom. Oyster spat prefer to “strike” or adhere to other existing oyster shell. They will also strike onto stone or artificial hard surfaces like concrete or bulk heads but the best by far is old oyster shell. What is an Oyster Reef Sanctuary? An oyster reef sanctuary is an oyster reef area designated by the Virginia Marine Resources Commission (VMRC) that is to be protected and not harvested to protect and promote oyster resources. Friends of the Rappahannock works with partners to establish our own version of sanctuaries. FOR will work with partners to acquire privately leased river bottom, restore reef habitat and oyster populations, and use them as demonstration sites for outreach and education so oyster reefs are allowed to thrive without being harvested. FOR is working with private lease holders to donate portions of their leased acreage to then be restored. What is an Oyster Sentinel? Oyster sentinels are 3D concrete structures bonded with recycled oyster shells. Each structure has about 100 recycled oyster shells adhered to it which provide the substrate for the growth of future oysters. They are placed on the river bottom in groups to create artificial reef areas. 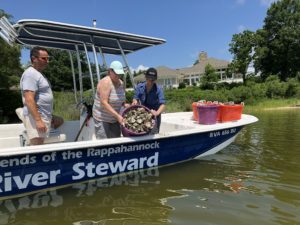 There are many ways to help restore oyster populations in the Rappahannock River and Chesapeake Bay. 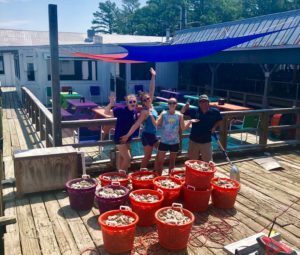 Join us for an oyster reef tour and install oyster shell on one of our reef restoration projects! Throughout the year, we take groups of all ages out on our River Steward boat to learn about oysters, oyster restoration, the history of the region, John Smith’s journey up the Rappahannock, the seafood industry, and much much more! We offer volunteer opportunities and paid tours. Check out our events page for current tours and projects or contact us to schedule a custom trip. Recycle oyster shells from home gatherings and encourage your local seafood restaurant to do the same. We have shell recycling centers in downtown Fredericksburg and at our office in Tappahannock, Virginia. Information on other shell recycling centers throughout Virginia can be found at the VCU Rice Rivers Center Oyster Shell Recycling Program and the Chesapeake Oyster Alliance. Sign up and volunteer for a reef building workshop to help us construct 3D oyster reef sentinels. This is a great activity for all ages and can be done in an hour or two. Contact us if you are interested. If you have leased river bottom in the Rappahannock River or one of the tidal tributaries, consider donating an acre or two to Friends of the Rappahannock. We will work with you and our partners to install a protected oyster reef sanctuary that will mature, spawn, and provide broodstock for the rest of the reefs in the area increasing productivity and the overall sustainability of the reef.